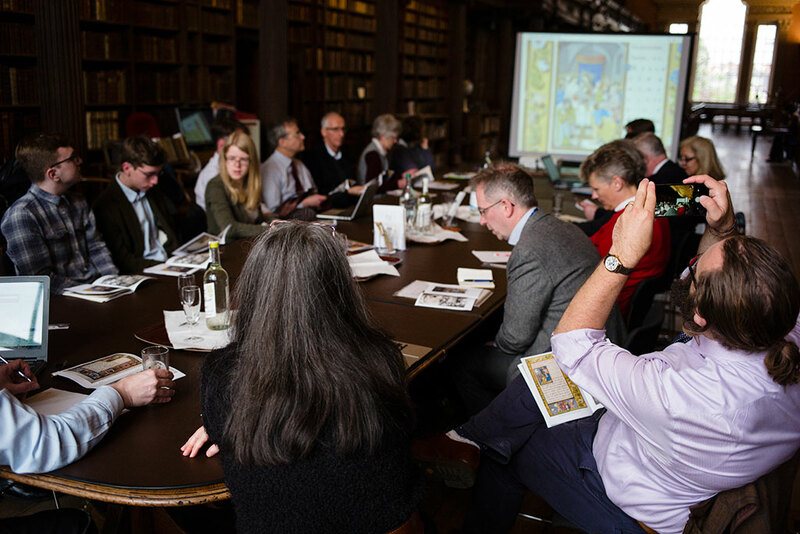 The roundtable held in the Upper Library of Christ Church, Oxford on the 12th of May 2017, was organised to coincide with the launch of this website, an online platform created to encourage the study of two manuscript books commissioned by Cardinal Wolsey in his later career. Thanks to the Mirador plugin, images from the two volumes in question, Oxford, Christ Church, MS 101 and Oxford, Magdalen College, Lat. 223, were viewed next to each other allowing for a direct comparison of two books that, despite having been commissioned (and meant to be used) as a pair, have been separate since at least the seventeenth century1. Whilst they have already been the subject of some scholarship – detailed under the ‘Research’ section of the website – the use of Mirador was pivotal in disclosing new questions and ideas during the roundtable, which mainly focused on the process of production of these two lectionaries, their purpose and use, as well as their later life and travels. The roundtable was thus a resounding success, shedding new light on the history of these unique items as well as their patron. The discussion was chaired by Dr David Rundle, who began by outlining what we know about the manuscripts: that they were made between 1528 and 1529, were written by the Dutch professional scribe Pieter Meghen, and that both had been in Winchester after Wolsey’s fall, before reaching Oxford during the seventeenth century. The roundtable then proceeded to consider those questions yet to be answered, such as where the lectionaries were made, who they were intended for, and what happened to them after Wolsey’s death in 1530. The conversation soon became controversial, as we considered who might have been responsible for the illumination of the manuscripts. Drawing attention to the style of the miniatures, Dr Scot McKendrick adamantly maintained that the manuscripts could have only been decorated on the continent, adding that it is unlikely that a single artist was responsible for their illumination despite the fact that scholars have referred to a ‘Master of Cardinal Wolsey’2. The homogeneity of shapes, he argued, certainly indicates the presence of a single model, but this could not arise from a single artistic personality. 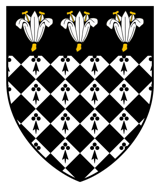 As he emphasised how the pattern was executed rather than what the pattern itself was, time was dedicated to compare the presentation of heraldry in the manuscripts with a royal Charter made for Cardinal College in 15293, as well as the two interpretations of the figure of St Frideswide4 . 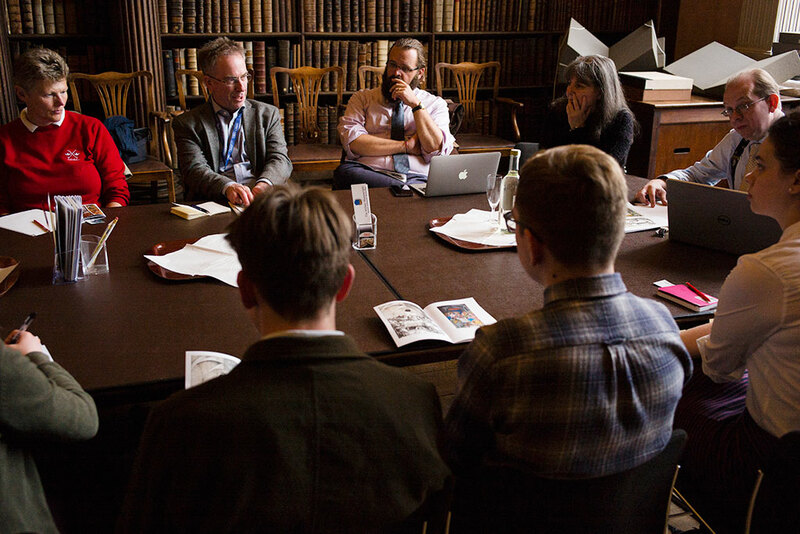 As a result of this discussion, the roundtable was in agreement that the lectionaries were likely the product of collaboration between artists working within one workshop. Indeed, it would have made sense for a master to be responsible for the miniatures while the apprentices worked on less eye-catching illustrations such as the borders and heraldry – in accordance with wider contemporary practice. There is also some evidence of an existing dialogue between the artist(s) and the scribe, as provided by Daryl Green, Librarian at Magdalen College, who pointed out that the rubrication on Christ Church, MS 101, f. 33v extends onto the illuminated initial5. This could indicate the rubrication had been inscribed subsequently to the illumination, and that Meghen could have done his work in two stages. However, after the roundtable Dr Rundle provided a convincing alternative explanation: since the borders often allow space for titles, the process must have been the reverse, with the illumination being added after the rubrication had been completed6. 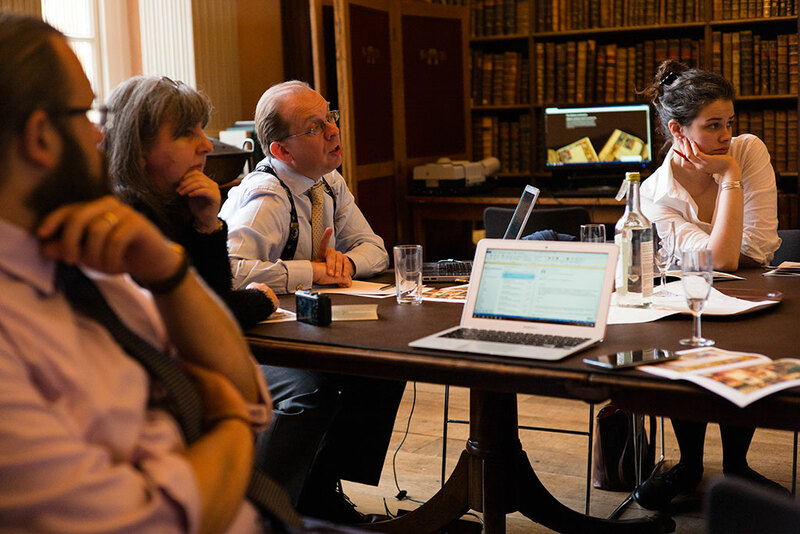 Subsequent discussion saw further questions arise about the manuscripts’ process of production. For instance, the blank pages in the Christ Church volume could suggest that it had been given to the artist unfinished, and that the remaining sections were never added as initially intended. This practice was not unusual within the context of the early sixteenth century, but it certainly complicates our understanding of the manuscript’s timeline. Indeed, it could also be an argument in favour of the close proximity of the scribe to the artist, which would somewhat undermine Dr McKendrick’s hypothesis on the manuscripts’ illumination given that Meghen was most likely in England. Although it is plausible that the lectionaries travelled across the Channel while they were being made, overall the roundtable could not reconcile the fact that the heraldry appearing in the Christ Church volume suggests an affiliation with Westminster, whilst the style of the illuminations indicates a strong connection with the Mannerist school centered at Antwerp. If the books did travel however, Wolsey presumably would have had an intermediary to manage the professionals involved in their production, and supervise their movement from one location to another. Meghen himself had covered a similar role when he was involved in the design of books for Erasmus. Despite this mobility, and the fact that he would have been fit for this task, there is no evidence he was on the continent at this time, as all other evidence from this period places him in England (if not precisely at the point of production of these two manuscripts). It is then more likely that if a third party was put in charge of the production of the lectionaries, they would have been associated with Wolsey’s household, with established networks linking them to workshops on the continent. As we have no examples of other manuscript commissions made by Wolsey during this quarter of the century, it can be difficult to reconstruct a more definite context for the lectionaries’ travels. For this reason, Professor Steven Gunn invited reflection on how Wolsey managed other commissions such as those of buildings, evidence for which is better documented7. This approach, he suggested, could direct us towards a more informed understanding of how the books were completed. Conversation then turned to consider how and why the books survived, and, in light of this, their original purpose and subsequent use. Since Wolsey would have needed many liturgical books for his foundations at Ipswich and Oxford, it has been speculated that the lectionaries were intended for Cardinal College. However, these would have been especially vulnerable during the reign of the reformist Edward VI. One could argue that the royal insignia in the Christ Church lectionary protected the books from destruction. Yet, as so many of Wolsey’s possessions were lost, it is impossible to make a thorough assessment of the dynamics of what was destroyed and why; the manuscripts could have survived merely by chance. In fact, the argument that sees their survival linked to their affiliation to Cardinal College is unsatisfactory, as textual evidence found in the manuscripts leads the reader to believe Wolsey’s personal Chapel was the more likely intended destination for the two volumes. In support of this last point, Dr Rundle and Prof. James Carley argued that the absence of certain saints’ feasts would make the manuscripts inappropriate for use at Cardinal College according to its statutes8. For example, the feast of St George is absent, and despite the fact that the royal insignia appears on Christ Church, f. 20r, Prof. Carley said there are many examples in existence suggesting this was not a conditio sine qua non for royal commissions. At this point the discussion moved to consider St Frideswide and the significance of her inclusion and portrayal in each manuscript. 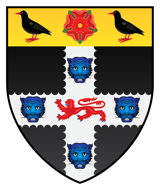 As the patron of the city and University of Oxford, one may believe that the decision to include her in the lectionaries signifies their affiliation to Cardinal College, designated to the Virgin and St Frideswide herself. This is probably because in founding his College in Oxford, Wolsey suppressed a series of priories, the most significant of which was that of St Frideswide. It is clear that it was Wolsey’s intention to move the shrine into the College Chapel for veneration, yet in the manuscripts the main feast associated with St Frideswide are either not mentioned (in the case of the Christ Church volume), or only cross-referred to (in the case of the Magdalen one, which momentarily addressed the translation of the relics only). It therefore seems more plausible that behind the commission of these volumes there was a different intention. While the idea that the manuscripts had not been made for Cardinal College was settling in our minds, the focus of our attention shifted to the depiction of St Frideswide in the miniatures. Discussion touched on how her cloak shelters the ox as she symbolically embraces and protects Oxford, and how the Magdalen interpretation of the saint seems to imply a more rapid execution. This could indeed be the case, considering that the speed of production was becoming a more pressing issue towards 1529: not only did Henry start to feel that ‘the cardinal was failing him’9, but Wolsey had also ordered a change in decoration to include his new bishopric of Winchester in the Magdalen lectionary. The depiction of her surroundings also caught the attention of the roundtable, as it is possible that an attempt was made at representing real buildings. In particular, Dr Cristina Neagu draw attention to how the miniature in the Christ Church volume especially seems to invite us to enter and partake, and Osney Abbey was mentioned as a possible candidate – although the possibility of it resembling St Frideswide’s priory itself was not completely abandoned. Finally, discussion turned to the significance of Frideswide not only within the tradition of a cult dating back to the tenth century, but the transformation of the saint into representing a more specifically English identity, facts that make both of these manuscripts more personal to Wolsey. That he chose this type of manuscript to be made, with such emphasis on English saints rather than a general calendar of major feasts, is a choice that hints at Wolsey’s own identity, again reinforcing the idea that they were made for one of his own Chapels rather than for the College. The books, however, never reached their intended ultimate destination, as Wolsey died in 1530 shortly after their completion. It is likely that they were confiscated by the Crown and possibly found their way into the royal library. However, by making a comparison between the lectionaries and Henry VIII’s personal psalter, Prof. Carley reminded us about the issues in regards to where exactly the manuscripts were, and how they avoided Edwardian attention. For instance, their presence in the royal library would make one wonder how they escaped the ‘purging’ of ‘superstitiouse books’ undertaken at Westminster in 155110. Their opulence and depiction of saints could easily have been seen to exemplify the allegedly idolatrous practices of Rome, and would have thus put the books at risk. Nevertheless, there are evident signs of use which point at the later life of these two lectionaries. The Christ Church volume in particular displays added punctuation and stress marks, as well as the erasure of any references to St Thomas Becket and papal authority11. Dr Claire Donovan also highlighted the evident signs of wear around the lower corners of the parchment, something it does not share with its Magdalen counterpart. It is impossible to determine with precision the time such heavy use was made of these lectionaries, but their lavishness would have certainly been appreciated during Mary I’s reign, when the country temporarily returned to its allegiance to Rome. As our time drew to an end, a few moments were dedicated to discuss the manuscripts’ bindings. 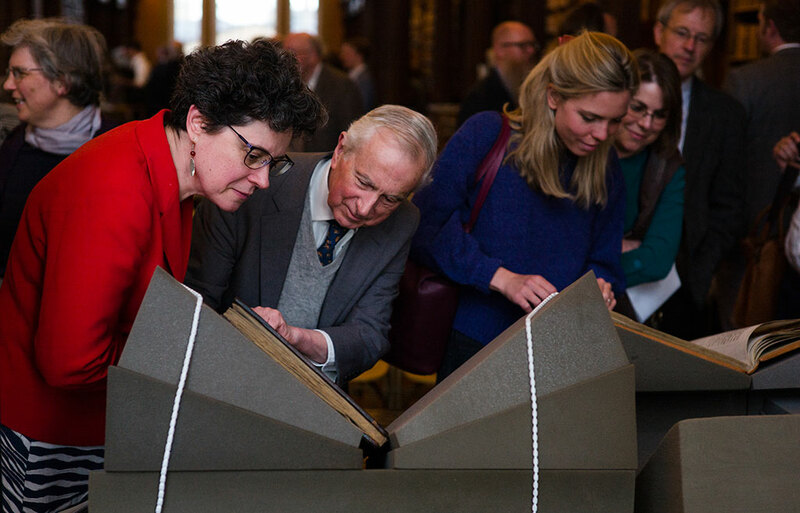 Most of the attendees referred back to the research conducted by Prof. Mirjam Foot, who analysed the binding of the Magdalen volume concluding that that could not have been the original one. In agreement with Prof. Carley, she also excludes any possibility that the manuscripts had treasure bindings, as if this had been the case they would have likely been moved to the Jewel House12. At the roundtable it was also observed that the Christ Church volume was likely rebound more times, the current one being from 1981, which was probably replacing an eighteenth-century binding. 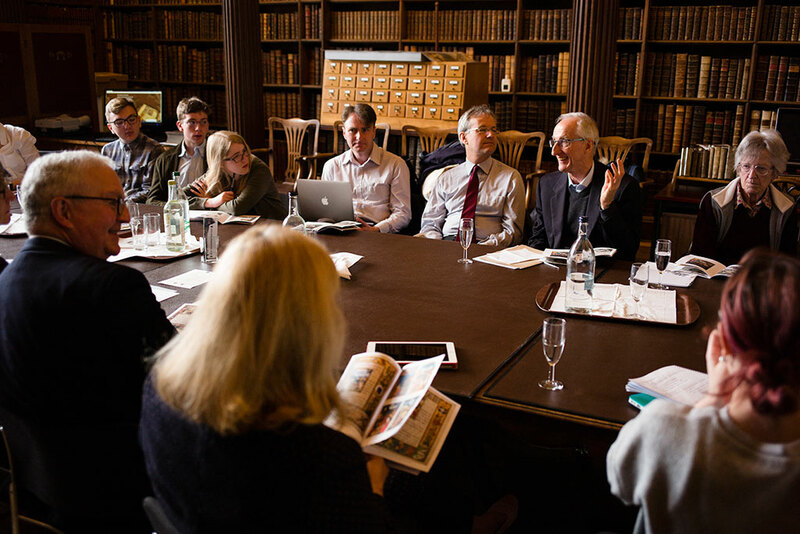 The roundtable concluded by briefly tracing the last movements of the manuscripts back to Oxford, making reference to the research conducted by Dr Christine Ferdinand, Emerita Fellow Librarian at Magdalen College, and Prof. Carley, which similarly appears on the website. Thanks to some evidence left in the Christ Church Donors’ Register13, she was able to retrace the Christ Church volume as a donation made to the College by the alumnus John Lante in 1614, whilst the Magdalen volume came to the college thanks to member of the Chappington family, who had connections with Winchester. 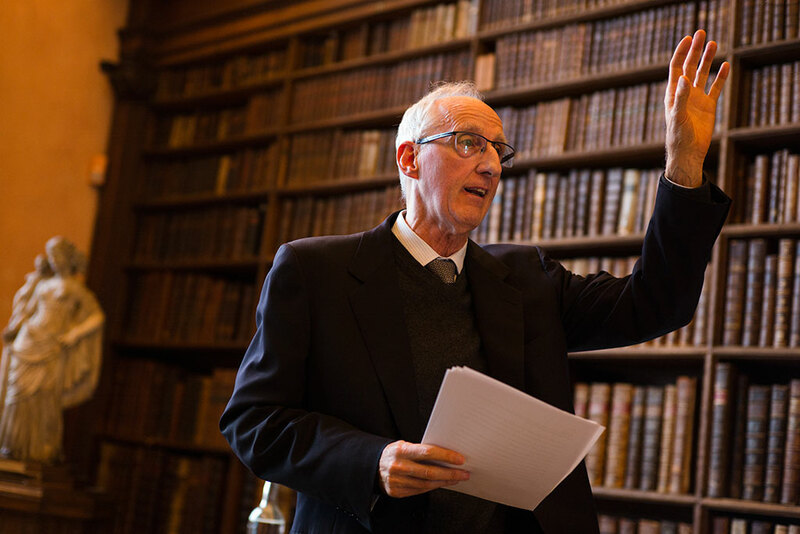 Although it is difficult to extrapolate the motives behind these donations, we know that Lante witnessed the will of John Chappington, creating a link between the two manuscripts’ arrival back to Oxford. 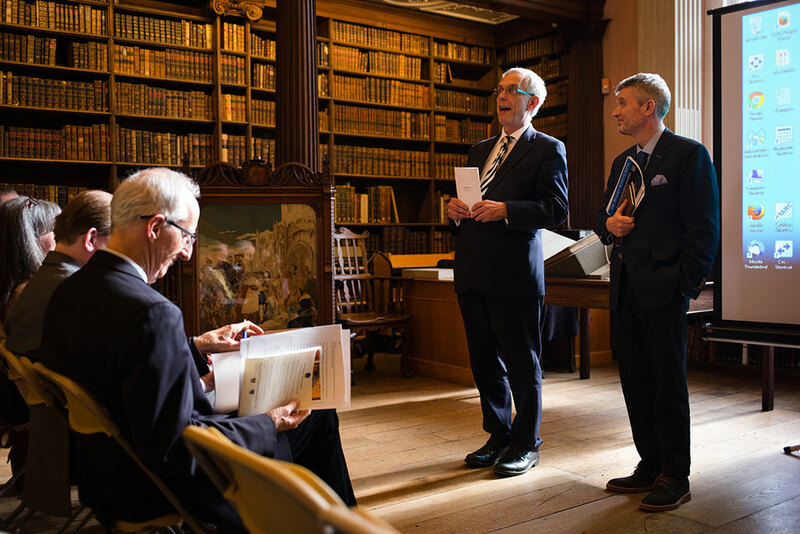 On this last note, the audience was then left free to admire the two lectionaries in the flesh, reunited at last. 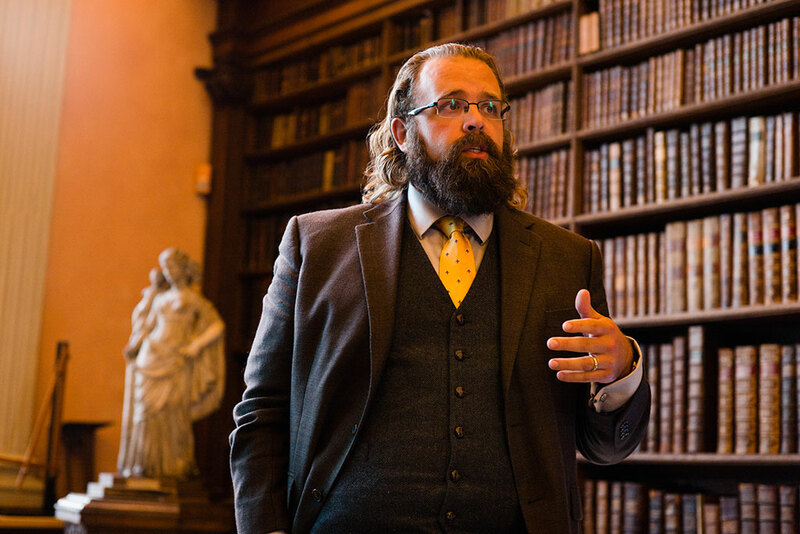 As someone who feels more confident in the analysis of medieval material, for me this roundtable was an occasion to reflect on the significance of commissioning a book in manuscript form at a time when print was shaping the Reformation’s spread across Europe. Although the gradual shift from handwritten to printed books saw both mediums exert an influence on each other’s format and style, the two Wolsey manuscripts unapologetically assert themselves as luxury products. Their form contrasts sharply with the understated aesthetic promoted by English reformers, marking the texts as symbols of an enduring connection to Rome. It would be limiting to presume that at the heart of Wolsey’s commission was simply an interest in grandeur, expressed in the style of the manuscripts’ illuminations. Venetian workshops had already demonstrated that printed books could be made just as lavish as deluxe manuscripts, and Wolsey could have easily asked for printed books to be made in a similar style, had he wished to do so. The lectionaries, then, suggest something different. They should not be considered as a mere (if ostentatious) display of wealth, but rather as evidence of a pointed allegiance to the Rome and its inheritance – of an idea of beauty and craftsmanship that was meant to glorify God and his church. With the ascent of reformers such as Cranmer and Cromwell at the court of Henry VIII, two manuscripts such as Wolsey’s lectionaries could have only been understood as asserting continuity with what was increasingly perceived by critics as popish idolatry. And yet they survived, which to me seems to imply that their beauty was believed by some to be more absolute than the uncertain contemporary political climate. And although they were probably kept out of sight until Mary’s ascent to the throne, it is clear that, somehow, there was still space to appreciate what was – and is – a work of art, an idea that finds some confirmation in the fact that Wolsey was spared the humiliation of damnatio memoriae. If the Cardinal had any presentiment about his imminent fall from grace, the fact that he confirmed the production of the Gospel lectionary in 1529 only further emphasises his commitment to the project he had commissioned. Perhaps it was also a reiteration of the belief that a book in manuscript form was still somewhat superior to print, as it was capable of inspiring reverence and awe as an object of worship – something that simply was not associated with printed volumes. However, after a paper delivered by Dr Neagu on emulation and originality in the lectionaries’ illumination, I was left wondering if they were copied from exemplars in printed form, as she discussed the similarities of the manuscripts’ miniatures to some of Dürer’s etchings14. This possibility is especially significant if we consider that the scribe Pieter Meghen also had experience of doing so15. If the manuscripts were indeed copied from printed books, then the lectionaries could be seen as artifacts aimed at transcending both forms, demonstrating that they were not meant to displace one another, but could work symbiotically for the purpose of innovation and reaffirmation. Their proposed idea of timeless beauty should then be seen as an attempt to create a dialogue, not only between different modes of expression, but also between reformers and those who retained their allegiance to Rome. 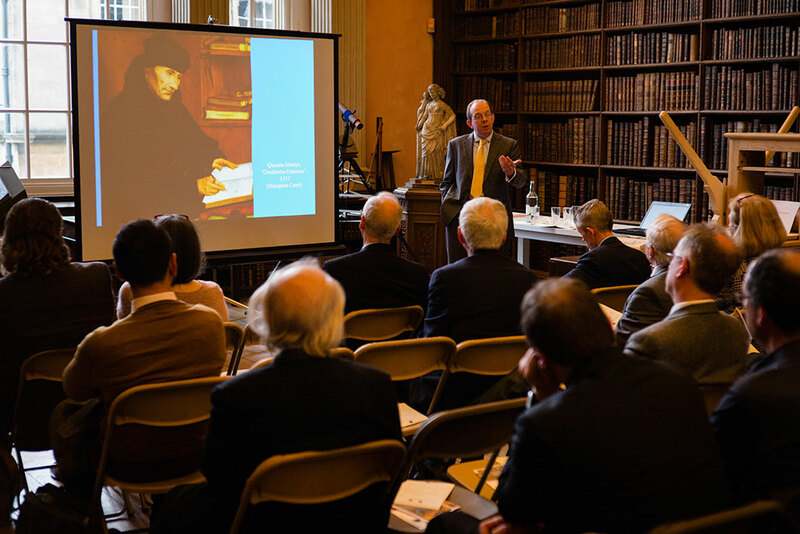 The launch event for the Wolsey Manuscripts Project took place on the evening prior to this round table discussion. Following an introduction by Professor Sir David Clary (President of Magdalen College) and The Very Revd Professor Martyn Percy (Dean of Christ Church), there were a series of talks by Dr David Rundle (Coprus Christi), “Peter Meghen, scribe, drunkard, and a waste of space”; Dr Cristina Neagu (Christ Church), “Emulation and originality in the illumination of the Wolsey Lectionaries”; Prof James Carley (York, Canada and Kent), “’The riche Cardinal of Winchester’ and his ‘gildid’ Epistle and Gospel Lectionaries. 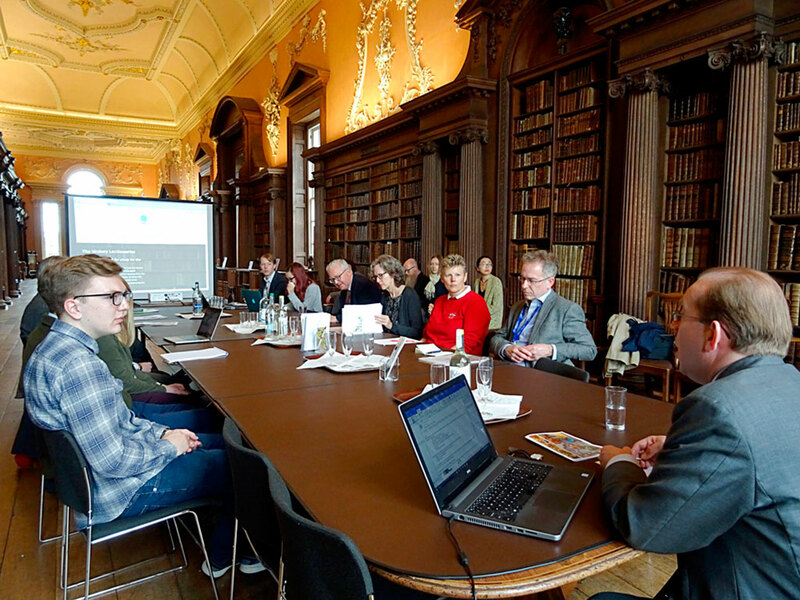 How far can the material evidence be pushed?” and Mr Daryl Green (Magdalen), “The Wolsey Manuscripts website and project”, concluding with a demonstration of the new website. The content of these papers acted in part as a starting point for the round table discussion summarised above. We are grateful to David Stumpp for photography at both events.